I was planning on sharing an outdoor post today but the weather hasn't been cooperating so I've been unable to take outside pics. Because of that I thought I would create a little Easter display with some of my cloches and other thrifty finds. 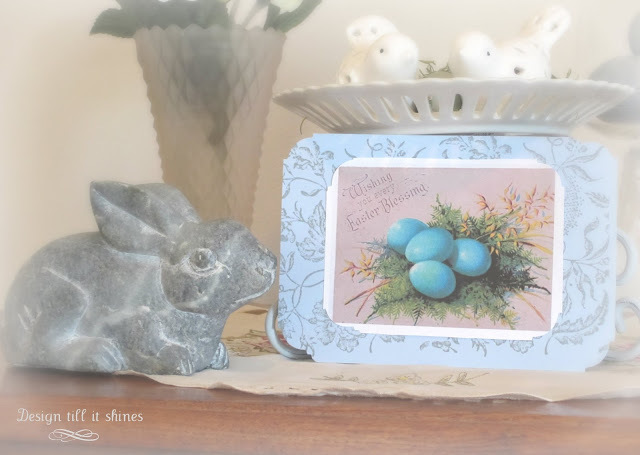 I hardly have any Easter decor anymore so I wasn't sure that I wanted to do an Easter post, but with some help from the Graphics Fairy I was able to create this simple vignette. I also haven't been blogging as much as I would like to. When I first started blogging I thought two posts a week would be my starting point. I haven't been able to do even that much! Blogging can take up quite a bit of time, so I am still working on that part and trying to post more often. Spring is my favorite season in the Pacific NW because the rain finally comes to an end, most of the time anyway. I really enjoy the process of putting a project together and posting it. 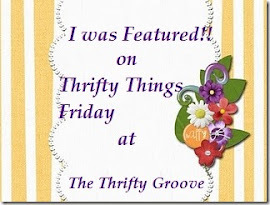 Of course my favorite part is sharing it and visiting other bloggers. All of you inspire me to want to create more, even if it's the simplest thing, because part of the joy is in the creating. The Graphics Fairy really came to my rescue on this project. I knew I wanted to use my apothecary jars and after visiting the website I came across these adorable Easter birds. I just slipped them inside my jars and started my vignette. It is definitely an eclectic mix but I decided to go with it and make it work. The indoor lights left a bit of a reflection on the cloches. 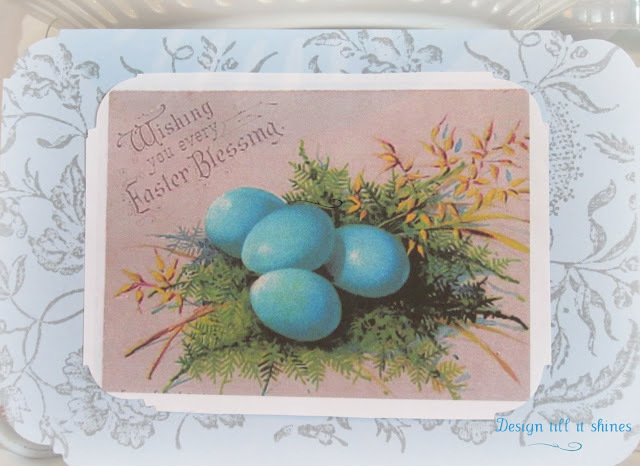 I love the colors of the bird graphic and the Easter greeting. 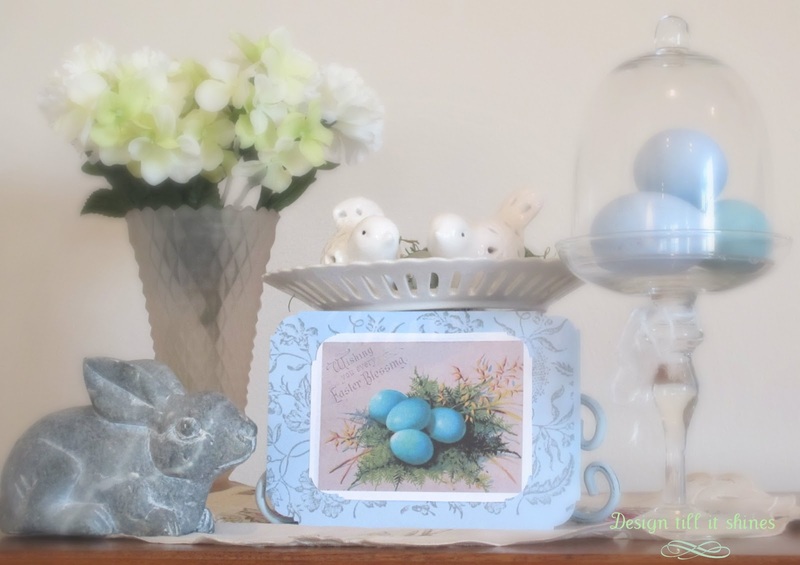 I only had a few wooden eggs on hand so I painted them in pale blue and green. I have a bunny couple statue that is really cute, but of course I have no idea where it is now, so I added my outdoor stone bunny. 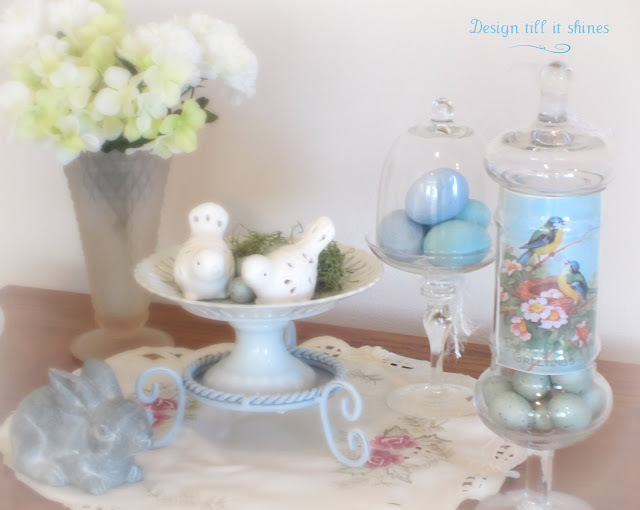 I also added a vintage vase and my white birds. I came across another Easter graphic of these lovely eggs. I decided to add these at the last minute and stamped an image on a card for the background. I love that pop of color. 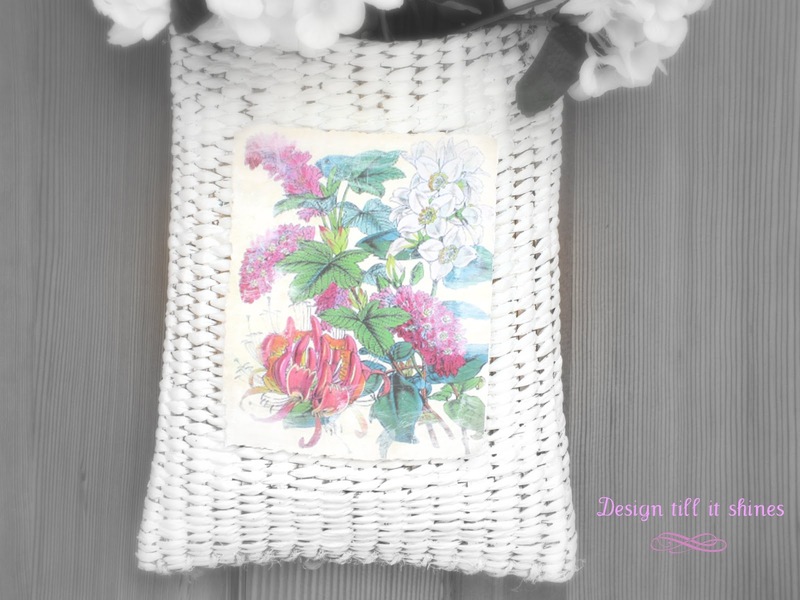 I'm working on a basket for the front door and I'll share more pics later when I have finished with it. 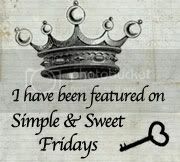 I really should dedicate this post to the Graphics fairy because this is yet another graphic from her website. Such pretty spring flowers. I'll probably be adding a bow to this basket as well. Thanks so much for stopping by and Easter Blessings to all! I love all the pretty pastels of Spring too. Thanks for visiting! 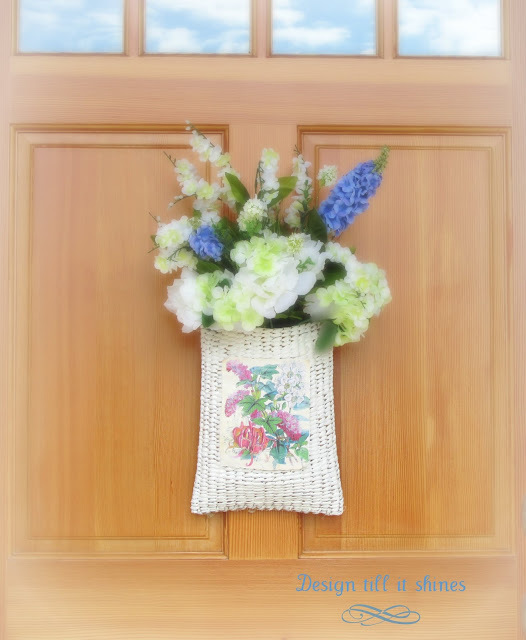 Your vignette is so lovely and I love your flower basket on your door too. 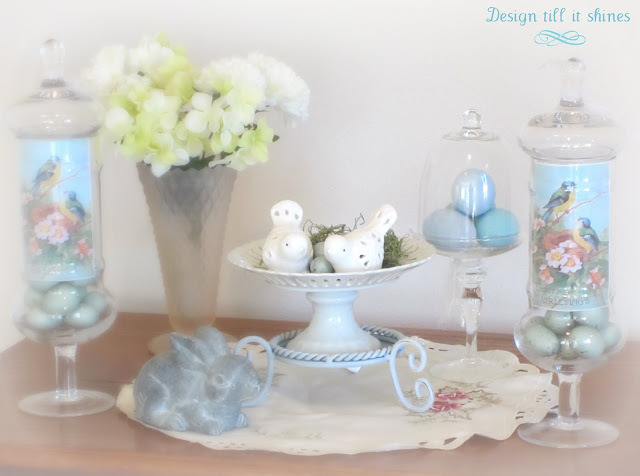 What a pretty vignette for Easter and Springtime!! My favorite colors! Lovely vignette. Your Easter vignette is so sweet. Love the soft colors this time of year. Thanks for following me Diane. I am following back. 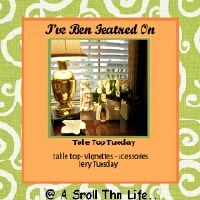 I love your vignettes and how creatively you put them together with what you had on hand! The Graphics Fairy is a life saver! Hi Diane - Love your Easter vignettes. Isn't The Graphics Fairy a wonderful source of inspiration? I'm not sure how you got the "foggy" look to your pictures but I love it! I love your sweet vignettes. 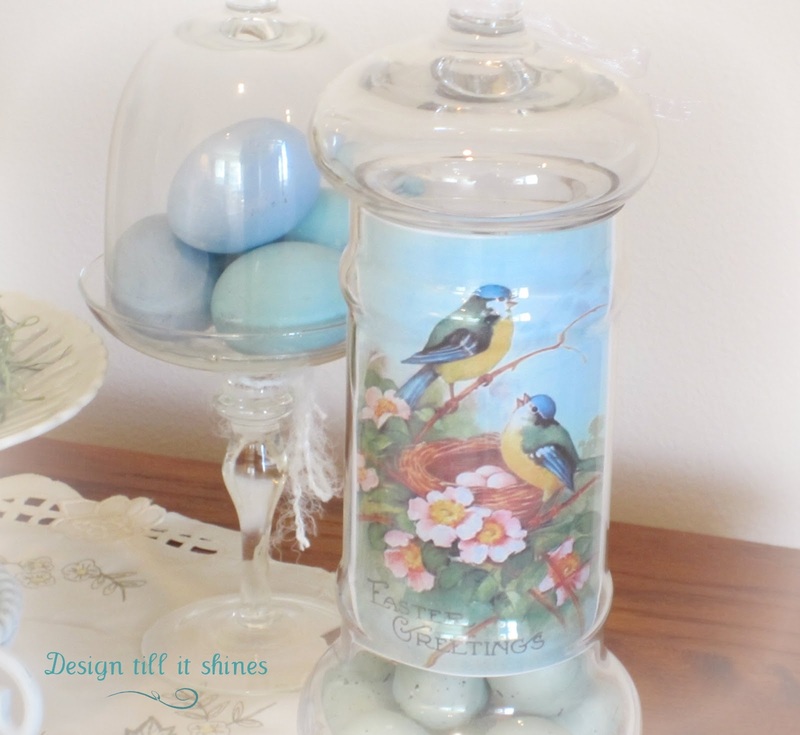 I filled a jar just like that with eggs today as I switched my Easter out for Spring. I love the graphic inside! May need to copy your idea if that's o.k. Thanks so much for sharing with SYC. Gotta love that Graphic Fairy! Thanks so much for stopping by and feel free to copy away if you like! 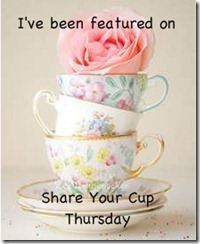 just popping back to let you know that I will be featuring you at Share Your Cup. Thanks so much. I appreciate the sweet comments. 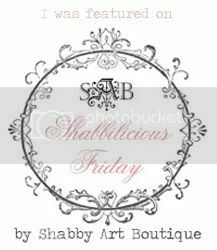 Thanks for linking up at Shabbilicious Friday this week Diane. I really enjoyed this post.